LONDON — IMAGINE if you grew up lying. Not a little bit, for convenience, but during every public moment of your life: at school, at work, at social events. You had to lie to survive, because the punishment for telling the truth was the loss of your academic or professional career, or even prison. For Russians who came of age before 1991, this is the only way they know. The mature generation grew up with this behavior during the later years of the Soviet Union: reading Aleksandr Solzhenitsyn and listening to clandestine BBC reports in private while pretending to be good Communist Youth League or party members. When members of this generation came to power they created a society that was a feast of simulations, with fake elections, a fake free press, a fake free market and fake justice. They are led by religious Russian patriots who curse the decadent West while keeping their children and money in London and informed by television producers who make Putin-worshiping shows during the day, and listen to energetically anti-Putin radio shows the moment they get into their cars after work. It’s almost as if you are encouraged to have one identity one moment and the opposite one the next. So you’re always split into little bits, and can never quite commit to changing things. But there is comfort in these splits, too. That wasn’t you stealing from that budget, making that propaganda show or bending your knee to the president — just a role you were playing. 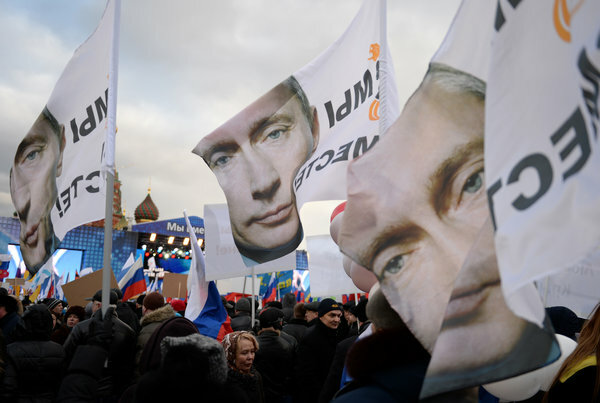 All cultures split the public and private selves, but in Russia that split is often total. The Kremlin’s goal is to control all narratives, so that politics becomes one great scripted reality show. The way it wields power illustrates and reinforces this psychology. Take Vladislav Y. Surkov, an adviser to President Vladimir V. Putin who is said to manage, among other things, the public image of the Russian-speaking separatist leaders in eastern Ukraine. He helped invent a new strain of authoritarianism based not on crushing opposition from above, but on climbing into different interest groups and manipulating them from the inside. On his desk in the Kremlin, Mr. Surkov had phones bearing the names of leaders of supposedly independent parties. Nationalist leaders like Vladimir V. Zhirinovsky would play the right-wing buffoon to make Mr. Putin look moderate by contrast. With one hand Mr. Surkov supported human rights groups made up of former dissidents; with the other he organized pro-Kremlin youth groups like Nashi, which accused human rights leaders of being tools of the West. In a novel presumed to be written by Mr. Surkov, who is also an art-loving bohemian when not waging covert wars, he celebrates the triumphant cynicism of a post-Soviet generation that has seen through the illusions of belief in any values or ideology. “Everything is P.R.,” my Moscow peers would tell me. This cynicism is useful to the state: When people stopped trusting any institutions or having any values, they could easily be spun into a conspiratorial vision of the world. Thus the paradox: the gullible cynic. As the Kremlin plays the West, we see it extend the tactics it uses at home to foreign affairs. The Kremlin courts the West’s financial elites, including the German and American business lobbies that opposed new sanctions; backs anticapitalist shows like Abby Martin’s “Breaking the Set” on the broadcaster RT (formerly Russia Today); and encourages the European far right with money and support to parties such as France’s National Front. The Kremlin can’t hope to dominate the West as it does the domestic situation, but its aim is to sow division, to “disorganize” the enemy through an information war. At the core of this strategy is the idea that there is no such thing as objective truth. This notion allows the Kremlin to replace facts with disinformation. We saw one example when Russian media spread a multitude of conspiracy theories about the downing of Malaysia Airlines Flight 17 over eastern Ukraine in July, from claiming that radar data showed Ukrainian jets had flown near the plane to suggesting that the plane was shot down by Ukrainians aiming at Mr. Putin’s presidential jet. The aim was to distract people from the evidence, which pointed to the separatists, and to muddy the water to a point where the audience simply gave up on the search for truth. Sadly, this mind-set resonates well in a post-Iraq and post-financial-crisis West increasingly skeptical about its own institutions, where reality-based discourse has already fractured into political partisanship. Conspiracy theories are prevalent on cable networks and radio shows in the United States and among supporters of far-right parties in Europe. President Obama, responding to Russian aggression in Ukraine, pointed out that Russia is not the Soviet Union. “This is not another Cold War that we’re entering into,” he said. “Russia leads no bloc of nations, no global ideology.” But perhaps he was missing the point. A version of this op-ed appears in print on December 12, 2014, on page A35 of the New York edition with the headline: Russia’s Ideology: There Is No Truth.